The ValuPro III Cleaning Kits offer the highest quality and versatility available on the market today, all in an attractive, significantly more compact case packaging! 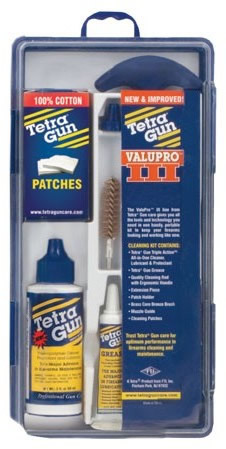 Now including Tetra Gun Grease, ValuPro III kits contain everything shooters need to maintain, clean and lubricate their firearms. ValuPro III Cleaning Kits are available for most calibers and gauges. This Kit Contains Triple Action (2 oz. ), Tetra Gun Grease (10g), bronze brush, bore mop, cotton patches, patch bolder, cleaning rod and extension pieces.